Stacy Harker bravely opens up about her life and shares her heartache and comfort. When you hear her story, it may seem familiar to you, because you may have read about it or even participated in the GoFundMe campaign that circulated to support Stacy and her three young boys after her husband was killed by a drunk driver while he rode is bike to work. Today we will laugh and rejoice as Stacy shares the way her beloved husband Matt filled her world with adventure and love, from salsa dancing the first time they met to proposing to her on a radio station. She shares about his love for cycling and about the special road ID bracelet that she bought him for Father’s Day and how her son now wears it every day. Stacy tenderly recounts the events of the morning of the accident and how she first saw the effects of it on Facebook. She shares the surreal feeling of the next two days and how bringing her oldest son into say goodbye to his dad was the single hardest moment as a mother. Stacy tells of the letter she received from the drunk driver and how it felt to address him in court in his sentence hearing knowing that his actions were the reason her husband was gone. 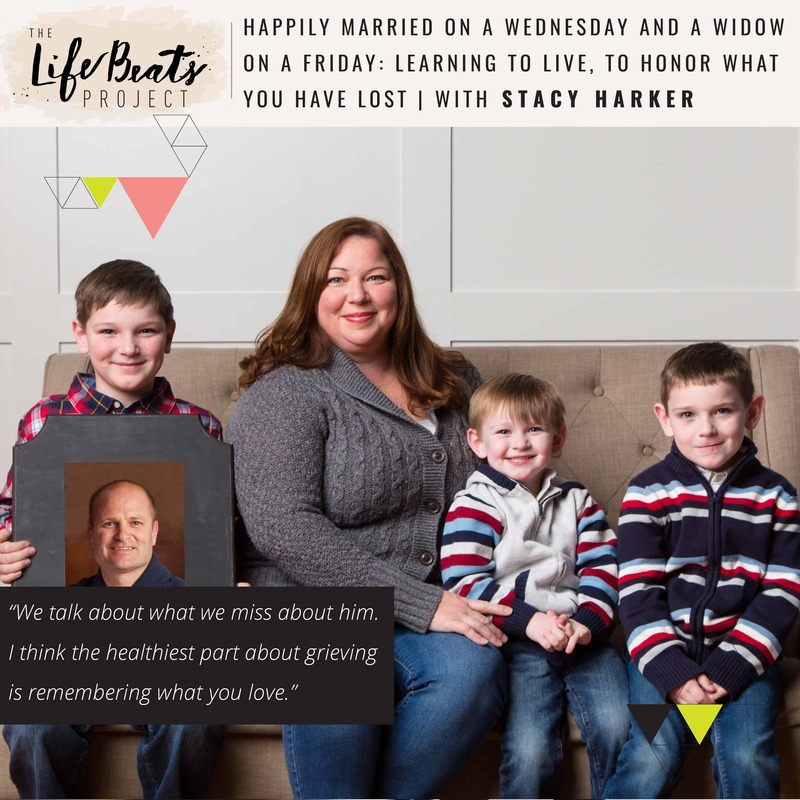 Stacy talks about the silver linings that have come from this all and how staying in bed to grieve was never an option, as she made decisions knowing that Matt would want her an the boys to live the best life possible with or without him. She shares what hiking a mountain at a widow support group retreat taught her and what she would say to someone who is going through this grieving process and to those who are not. Come listen with a set of tissues and a grateful heart. Want to know if this episode it for you? This episode is perfect for someone who has lost a spouse or a loved one, who has loved deeply and now finds themselves alone. It is perfect for someone who is the victim of the choices of others’ actions, such as a drunk driver. It is also for those who are ready to direct their grief toward living in a way that would honor who they have lost. It also for a powerful reminder for those who have not suffered a loss, to treasure the moments they have with their loved one and have the hard conversations to prepare for life should one or both of you be gone.